Ocho instalaciones de larga escala de artistas brasileños, desde los 1960 hasta el presente, presentadas en la Schirn Kunsthalle Frankfurt, Alemania, 2 oct. 2013 - 5 enero 2014. 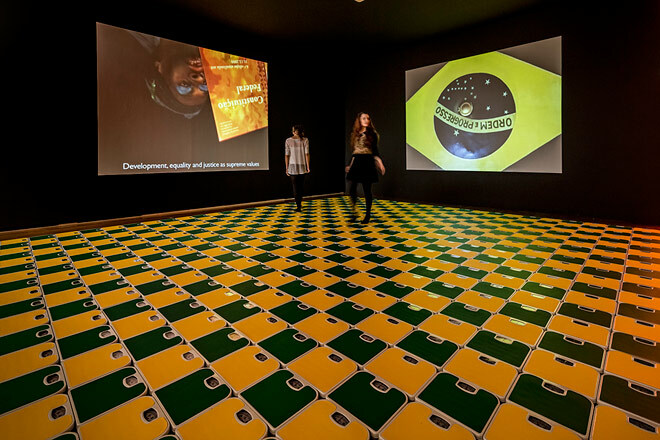 Con motivo de la presencia de Brasil como invitado de honor en la Feria del Libro de Frankfurt, la Schirn Kunsthalle Frankfurt presenta la exposición Brasiliana: Ocho obras instalativas de larga escala transforman sus salas del 2 de octubre 2013 hasta el 5 de enero de 2014 en una serie de espacios que pueden ser experimentados intensamente por los sentidos, y con instalaciones en las que los visitantes son directamente integrados como participantes. Con ejemplos de obras de fines de los 1960s hasta las últimas posiciones artísticas, la exposición destaca aspectos especificamente brasileños de este "arte de experiencia." La muestra combina posiciones hoy día consideradas como clásicas, como las de Hélio Oiticica y Neville D'Almeida, Lygia Clark, Tunga, y Cildo Meireles, con obras de artistas más jóvenes como Ernesto Neto, Maria Nepomuceno, Henrique Oliviera, y Dias & Riedweg. The medium of the installation is manifested more clearly than elsewhere in the young country of Brazil, which is characterized more by the modern and contemporary than tradition-laden Europe is. The origins of the installation in Brazil reach back to the 1960s and were influenced by an occupation with the theories and modernist currents of the Western art scene. It led to an originally Brazilian art, which thrives on the interplay of different cultures and is characteristic, powerful, and expressive, focusing on the sensory and even physical penetration of the works of art. Avant-garde artists such as Lygia Clark and Hélio Oiticica recognized early on the potential that lay in breaking free of conventional artistic genres and methods. They parted ways with the two-dimensional painting and designed a dynamic art that is closely tied to life, makes diverse local references, and draws the viewer into the center of artistic production: Art became an expanded aesthetic and sensory experience. This approach is reflected in a variety of aspects in subsequent generations of artists. For example, the artists Cildo Meireles, Tunga, Ernesto Neto, Maria Nepomuceno, Henrique Oliviera, and Dias & Riedweg regard the connection between art and life as just as elemental as concentrating on the viewer, whose senses are addressed in different ways. It is striking that particular attention is paid to the body as a whole: Seeing a work of art as a primarily visual form of reception recedes in favor of other senses such as smelling and hearing. The artists produce extensive, space-filling spaces that completely involve the viewers, surrounding them, occupying them, assimilating them, and challenging them physically, tactilely, and visually. Dr. Martina Weinhart, the curator, about the exhibition: "Along its path to a new tropical culture, Brazil developed its own form of modernism, which draws on diverse influences. The result was a dynamic art that is closely linked to life and expresses the international vocabulary of modernism in a language that is typically Brazilian. Far from the common clichés about their country, Brazilian artists since the 1960s have developed highly exciting and multisensory strategies in which the viewers' participation, the tactile, and touching the entire body play central roles. The Brazilian installation is a medium of personal experience." The evolution of the oeuvre of Lygia Clark (1920-88) can be seen as a continuous break from the object. Coming from Concrete painting, she sketched a completely new understanding of art, at the center of which stands her interest in inspiring the audience to participate. In her large-scale labyrinth A casa é o corpo, produced for the Venice Biennale in 1968 and now on view at the Schirn, viewers can pass through the stages from conception to birth once again symbolically. The spacious work offers a broad spectrum of possibilities for viewers to get involved. Clark, who for years was intensely engaged with psychoanalysis, focuses not only on the physical experience of her art but also the psychological experience of it. The work enables those who participate to explore their own psychological and physical reality and to sharpen their view of it. In their video installations, the artists Dias & Riedweg address Brazil's social reality via a documentary approach. In their work Universo do baile (2008), the artist's sketch a disturbing image of the country's society. Video sequences of a person, helpless and obviously out of his depth, trying to read the Constitution of the Federative Republic of Brazil, flanked by scenes of a baile funk, an open party in the favelas. The state national flag with the motto "Ordem e Progresso" (Order and progress) seems to float above it all. The videos of the Brazilian artist Mauricio Dias (b. 1964) and the Swiss artist Walter Riedweg (b. 1955) involve the visitor not only as a viewer but also as a witness to the events by offering a dance floor consisting of 550 scales in front of the screens. Cildo Meireles's (b. 1948) sound installation rio oir (2009/13) is directed first at hearing. It is composed of sounds the artist collected only trips along Brazil's great rivers. He brings them into the museum as an atmosphere, where the audience can listen to them in two separate rooms. The one room is lined with shimmering silver foil; the other is completely dark. Meireles, who as one of the most important representatives of the Brazilian avant-garde can look back on a long career, worked increasingly conceptually with subversive interventions during the military dictatorship of the 1970s. Then in the early 1980s he produced large-format sensory environments. In all his works, Meireles knows how to tie reflection on social and political reality to the viewer's sensory experience. The works of Maria Nepomuceno (b. 1976) grow rampantly like uncontrolled vegetation in the exhibition space, seemingly taking root everywhere like organisms. At the same time, however, the forms grow in a strangely artificial environment; archaic and playing with a primitive formal idiom, they are produced highly artificially from cheap industrial materials. Plastic beads meet clay, hemp rope, and straw; abstract, biomorphic forms meet completely ordinary objects. Everything is subjected to a constant process of transformation: sculptures are designed and produced for one exhibition then integrated into the next in a different form and constellation. Nepomuceno developed a new work especially for the Schirn Kunsthalle titled Magmatic (2013). With Ernesto Neto (b. 1964), the audience perceives the smell of the artwork even before it sees it. Visitors can enter, touch, smell, and hear Neto's often monumental sculptures. They activate all the senses, demand time for intense exploration, and place the viewer's own physical experience at the center of the artistic experience. The work Life is A River (2012) essentially consists of three large bodies of elastic fabric, filled with cumin and turmeric, hanging down just above the floor like pendulums. The work was produced for the first Kochi-Muziris Biennale in Kerala, India. While in exile in New York, the artist Hélio Oiticica (1937-80) and the experimental filmmaker Neville D'Almeida (b. 1941) produced a series of five works jointly in 1973 that is now known as Cosmococas. It consists of playful, hallucinatory environments that offer space for diverse impressions, experiences, and experiments. Each consists of a quasi-cinematic projection of slides with icons of Western popular cultures such as Marilyn Monroe, Yoko Ono, and John Cage, with their images crossed by lines of cocaine. The projection features background music and is integrated into an installation that expands a purely visual reception by adding various physical experiences. The Schirn will present Cosmococa CC5 Hendrix War. Henrique Oliveira (b. 1973) makes walk-in sculptures from simply, ordinary, "poor" materials of the sort found everywhere in public places in Brazil and thus links aesthetic experience to a social perspective by means of materiality. His raw material is tapumes: large construction fences of very thin plywood employed all over Sao Paulo, which is then taken as construction material in the favelas. Oliveira works this wood using an organic, soft formal idiom to create enormous, cave-like installations through which viewers can move. This is also true of the work that Oliveira has created especially for the exhibition at the Schirn. In his surreal, tropical baroque style, Tunga (b. 1952) has created surprising and strange worlds, into which he integrates sculpture, installations, and performance in equal measure. The focus is on the symbolic and the imaginary. Tunga builds expressive installations of magnets, iron, wire, glass, and crystals. By combining unusual materials, the artist makes viewers unsure of their perception, allowing subtle, psychological forces to affect them that play with ritual, the archaic, and the hidden. This massiveness cast in bronze nevertheless retains an aspect of ephemerality, as is the case with Triade Trindade (2002), an installation that will be unveiled in a performance at the exhibition opening on 1 October at 7 p.m. Female performers, surrounded by men in prison garb, will smear themselves with makeup in a cryptic ritual around an open fire that strangely suggest cannibalism. Alchemy, magical recipes, the evocation of nature—the universal meets the everyday, high and low fuse, and everything is always in transition. Becoming rather than being. The exhibition is supported by Funarte as well as by the Ministry of Culture and the Foreign Ministry of Brazil. It is also supported by Novomatic AG. Edited by Martina Weinhart and Max Hollein. Foreword by Max Hollein; introduction by Martina Weinhart; essays by Caué Alves, Monica Amor, Michael Asbury, Paula Azulgaray, Fernando Cocchiarale, Rafael Cardoso, Jochen Volz, Guilherme Wisnik. German/ English edition, 160 pp., ca. 160 illustrations.